Fluids are practically incompressible and cannot, therefore, store pressure energy. 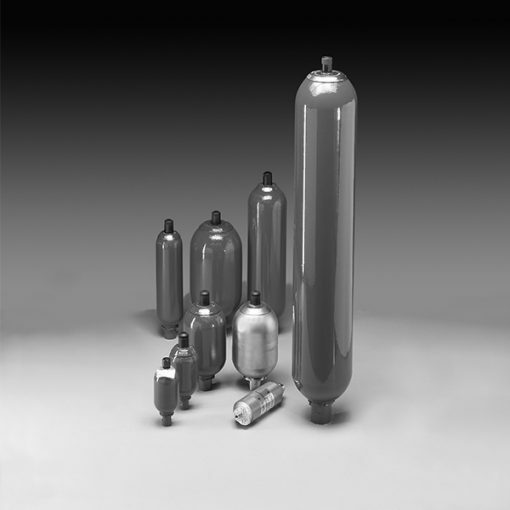 So, the utilisation of compressibility of a gas in hydraulic accumulators is for storing fluids. That’s why HYDAC bases its bladder accumulators on this principle, using nitrogen as the compressible medium. Indeed, a bladder accumulator consists of a fluid section and a gas section with the bladder acting as the gas-proof screen. Hence, the connection of the fluid around the bladder to the hydraulic circuit results on the bladder accumulator drawing in the fluid. It happens when the pressure increases, leading to the compression of the gas. As a result, when the pressure drops, the compressed gas expands and forces the stored fluid into the circuit.